The above photo was a few days ago, a fluffy bunch of stuff in two nights: 4″ then 5″ on top of that. As you can see, the sun is out and predicted to be so for the near future, so we decided to wait and let nature take its course. In the meantime, it seemed fitting to make a batch of my favorite soup. Cook your beans in a clay pot or by another method, with a miripoix. Store in the refrigerator in their liquor until you’re ready to use them. Peel and cube 3 medium potatoes [300g] and reserve in cold water to cover. Start the bacon in a bit of olive oil in the Green Le Creuset pot until it has rendered most of its fat. [At the same time, brown two fresh Italian sausages, if you’re using them.] Add a rough chopped onion and sauté until crisp tender. Add a two-2-finger-pinch salt/pepper mix. Add garlic to taste and cook until fragrant. Add about an inch of celery [100g] chopped from the top of your head, 3 medium carrots [100g], sliced, potatoes and their soaking potato water to your pot. Add a two-2-finger-pinch salt/pepper mix and stir. Add broth — if needed — to barely cover. Add a bit of dried thyme and oregano. Cook for about 10 minutes until the potatoes are tender. 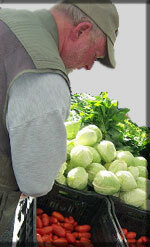 Add half of a medium cabbage, chopped or sliced. Add cooked meat (ham, sausage if using) here, if you want. Add 2 cups beans and their liquor. Add enough stock to make it soupy. Bring to a simmer and turn off the heat. Salt and pepper to taste. The deal is, when you use fresh ingredients in suitable proportion and cook with care, the result can’t be bad. Cooked 2.16 — RG Alubia Blanca, young, tiny, tight red cabbage, two links of LO grilled Merguez sausage. Cooked 1.16 — Iacopi Italian Butter Beans. Browned 2 links Basque Chorizo sausage with the bacon, cut in thirds, removed and then “sauteed “ the onions in that liquid. Lends a bitchin’ richness to the soup. Used home made *enhanced* turkey stock. Red cabbage. Did not use bean liquor ‘cause C is afraid of beans. Most Yummy. Cooked 6.14 — Cassolet beans RG, LO cooked beet greens: shredded [‘cause I had no cabbage], redskin potatoes, chicken broth… no meat except the bacon used to cook the LO greens and used to cook this dish. Good anyway. Cooked 11.12 — Inspired by “Crispy Potatoes” brought home from CAMPO. Otherwise, did the regular recipe, but didn’t have any cabbage, pity. Not bad, but better with fresh potatoes and cabbage. Cooked 10.12 — Had about 1 1/2 cups LO Italian Butter beans that weren’t cooked to creamy softness. Started with 2 slices of bacon in a bit of olive oil, cooked and removed bacon. Added 1/2 chopped onion, some garlic, 1 1/2 sliced slender carrot, sliced stalks of a fennel bulb, three whacks of celery, one potato cut into matchsticks, the beans and their juice and some chicken stock. Cooked 12 minutes. Pureed with immersion blender. Pretty good, beans still a little grainy. Cooked 7.12 — about 3 cups Bobs Bountiful Black Beans… about 1/2 pound slab bacon very thick sliced… DIS is good, still. Cooked 9.10 – Iacopi Italian Butter Beans, spring onions, with cabbage… added 1C raw CP raw tomato sauce at end… otherwise as written. Cooked in Joyce Chen Wok. Still good. C scarfed and took LO for tomorrow lunch. Cooked 5.10 – Iacopi Italian Butter Beans, spring onions, green garlic, with cabbage… otherwise as written. Cooked in Wendell Wok. Still good. Cooked 2.10 w LO Super Bowl vegetables: carrots, romanesco, fennel, green beans, baby zucchini, red and yellow bell pepper, Brussels sprouts, celery, Tokyo turnips. Bacon, spring onions and garlic as directed. No cabbage. Yes potatoes. About 3 cups water, 3 cups chicken stock, 1-cup turkey stock. Cooked in Joyce Chen clay pot. 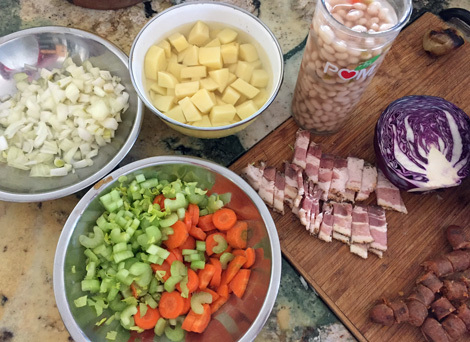 Cooked 1.10 – In Wendell wok with spring onions and the other stuff, plus cabbage… eye of goat beans that had been cooked with a ham hock. NOTE: This is very similar to simply recipes.com Minestrone except that Minestrone has zucchini, parsley and tomatoes. Other minestrone has green beans and spinach, as well. So its really not very similar at all. This entry was posted in Reno, San Francisco, soups. Bookmark the permalink. I love looking at your pictures of the “white stuff” then I thank my lucky stars I don’t am in Tucson. My father was a soup conjurer extraordinaire. I still long for his homemade vegetable beef soup containing everything but the kitchen sink; his ham & dried lima bean soup; the sauerkraut, pork, mushroom soup he made for Russian new year?? These are my favorites. Dad could make soup from anything. You have shown your talent in this area too. The red cabbage was a shock, but a good one. Thank goodness we’ll be eating dinner soon. Unfortuntely, not soup tonight.